Individual change will lead to a social change and vice versa. Feminist intervention is summarized by offering help, support and empathetic listening while in alliance with women. In a few words, it means that we consider the other person our equals. We won’t ever use our differences in order to gain a position of power. This also includes relations in which the process is equally, if not, more important than the result. Is a relation that we will encourage you to develop with the other women residing at the shelter. It is a bond of mutual benefit and reciprocity between individuals or groups of individuals based on a common interest. With everyone residing at the shelter, we have the desire to develop a relationship of mutual trust which encourages autonomy and the regaining of power. Being in alliance also entails maintaining a real interest for the other person. 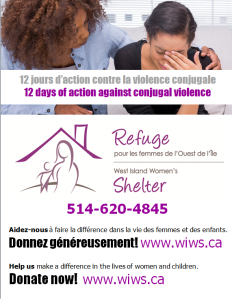 During all of our interactions with the women and children clients of the West Island Women’s Shelter, we will always be transparent. It means that we will express the truth without transforming it. Respect is really important for us. It is a sentiment that brings us to value the woman, to see her as a person of value and dignity, to accept her as a person, as she is. Like the other values that guide our intervention, cooperation is to demonstrate a genuine interest for your needs and rights as well as those of others in order to develop a relationship as egalitarian as possible. Cooperation is a value and a way of being and to act that aims to block the dominant social values like individualism, competition, high emphasis on performance and overconsumption. In order to achieve this, cooperation applies the following rules: no secrets, no lies, no power games, no rescuing. Our meetings and our interventions with you will allow you to acquire and develop your personal, individual and collective power. This translates into experimenting with a decision-making process that requires from you awareness and self-reflection in order to be the actor of your own life.